Strike a sophisticated silhouette while wearing this breathable cotton-jersey abaya. The double-brea..
Women's jilbab in a wonderfully light and stretchy lycra in Black. With a detachable belt and a pane..
Women's jilbab in a wonderfully light and stretchy material in Black. 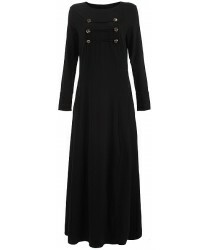 With a sequined lace bodice an..
Women's jilbab in a wonderfully light and stretchy material in Black. With a sequined motif on the s..
Women's jilbab in a wonderfully light and stretchy lycra in Black. With a velvet bodice and a collec..
Womens 2 Piece Prayer Outfit Somali Style This is a free size 2 piece garment (Skirt and Hijab ..
Two piece. Thin and light-weight over garment. Generously sized for length and comfort.Made from a s..